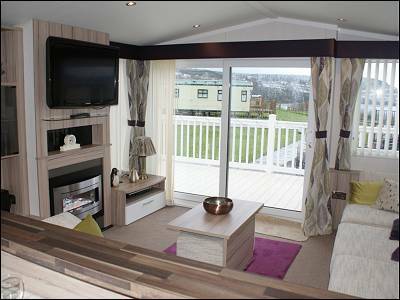 Cardigan 37 Luxury Caravan at Quay West, New Quay, Wales. 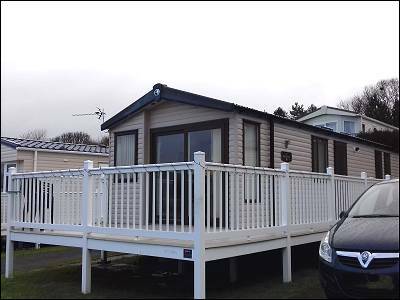 This is a new 3 bedroom double glazed and centrally heated 2017 Swift Moselle with white wrap-around UPVC deck, outside furniture, and a wide view of Cardigan Bay and New Quay. 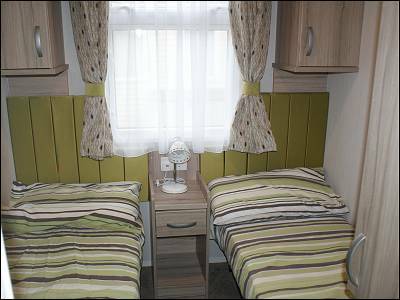 It has a double bedroom, en-suite WC and basin, two twin bedrooms and also a sofa bed in the lounge. 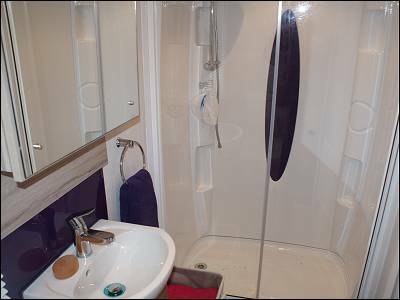 There is a family shower room with shower, WC and washbasin adjacent to the twin bedrooms. One well behaved small dog welcomed. 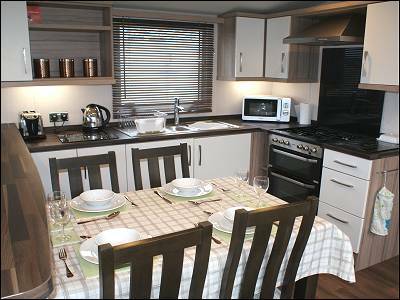 Accommodation - The well equipped kitchen has plenty of cupboards, dining table and chairs, a full size gas hob, grill and oven, microwave, kettle, toaster and family sized integrated fridge with 3 drawer freezer under. The lounge has a 42 wall mounted inch flat screen TV, sofas and stools seating 8 including a pull out sofa bed. There are also USB slots suitable for mobile phones. 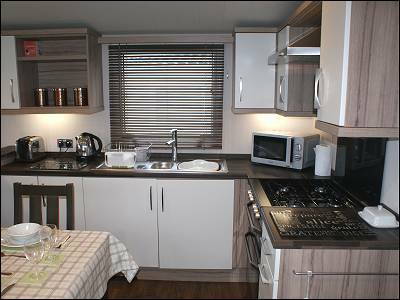 Fully centrally heated, with radiators throughout, the caravan also has a wall mounted coal effect electric heater in the lounge. There are 3 steps up on to the new white UPVC deck which, with outdoor furniture, gives wide views over Cardigan Bay, new Quay and the Harbour. . Below the caravan park, the wide sandy expanse of Traethgwyn Beach offers safe bathing and walks at low tide into New Quay or in the other direction to Llanina point and Cei Bach beach beyond. 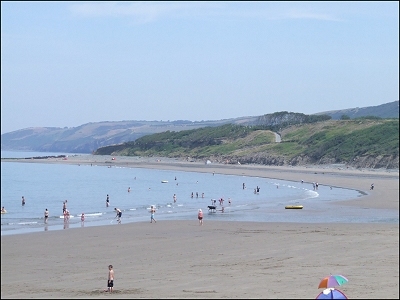 From the park, guests can walk the coastal path to Cwmtydu and Llangrannog to the south or to Aberaeron and Aberystwyth beyond to the north. Duvets and pillows provided, including the sofa bed but please bring bed linen and towels. Parking for one car beside the caravan and extra parking close by. One well behaved small dog welcomed. 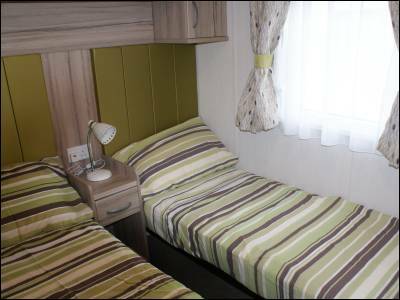 Liability: The hirers contract for all bookings is directly with the owner of this caravan. 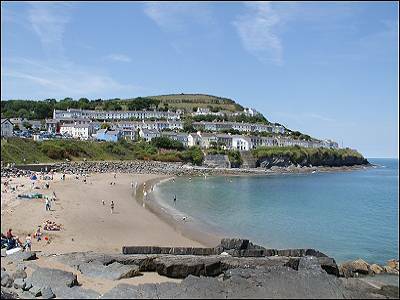 West Wales Caravans act only as advertising agents on behalf of the caravan owners. 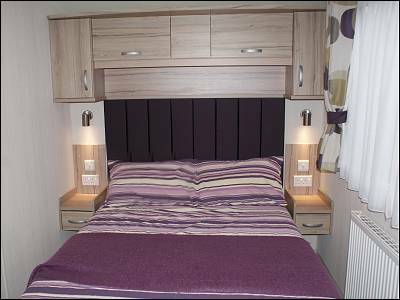 The owners will be responsible for complying with all maintenance, cleaning and applicable Statutory Regulations and Discrimination Acts affecting customers, the Caravan, and its equipment. 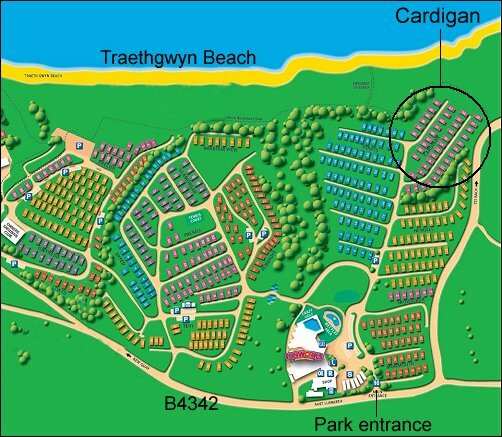 West Wales Caravans cannot accept any liability for any shortcomings or defects within, outside, with the contents, or other facilities ancillary to the caravan.